If you or someone you love enjoyed the first Expendables movie, then you will definitely want to get yourself (or them) this one as well. It’s funnier, more well written, and more plot driven while still offering the audience lots of the action they love. It makes a great gift and is definitely worthy of any collection, especially in the 4K format. It's very rare when a sequel manages to be as good as the original movie and even rarer still when the sequel is actually better than the original. You can probably count on your right hand how many times that has happened in filmmaking but, if you did, you would have to include The Expendables 2 in that illustrious grouping. While the first film lacked some substance and the script was lackluster at best, the second movie in the series doesn't suffer the same fate. The action is still there, with even more stars this time around, but the story, the writing, and the direction are even better. Barney Ross (Sylvester Stallone; Rambo) and his team are once again put upon by "Mr. Church" (Bruce Willis; Die Hard) but this time their mission is set to yield them not a cash prize but their freedom from impending jail instead. Church wants Ross to recover a valuable from a plane that crashed. This time, though, Church insists Ross bring one of Church's associates who is an expert in this field and Ross is less than pleased, especially after finding out the individual is female (Nan Yu; Beloved). Along the way, the Mercenaries meet up with Vilain (Jean-Claude Van Damme; Bloodsport), who not only steals the item Ross intends to give Mr. Church in order to "buy" their freedom but he also kills Billy the Kid (Liam Hemsworth; The Hunger Games Series). This sets Ross on the warpath determined to destroy Vilain. Ending up in an abandoned mine in Russia, Ross and his team stop Vilain and manage to capture all the plutonium that was stolen. Besides Stallone (who also co-wrote this second script) and Willis, there are a number of big names attached to this film. Jason Statham (The Transporter) once again joins Ross as his right-hand man and their team consists of Terry Crews (Everybody Hates Chris), Dolph Lundgren (Rocky IV); and Randy Couture (Ambushed). Joining the group are great cameos by Chuck Norris and Arnold Schwarzenegger (The Terminator) and all are well versed as the action heroes we love watching on the big screen. Director Simon West (Con Air) lends a different perspective on the movie that Stallone did the first time around. For starters, there are fewer quick cuts, which allows the audience to enjoy the action more. Gone are the ADHD-addled "8 shots in 4 seconds" scenes and are this time replaced by longer sequences that make the action more understandable. The 4K Blu-ray is presented in 2160p high definition video with a 2.35:1 aspect ratio. The colors are muted, yet warm, and the pictures are sharp. Gone, too, are the sweeping scenic views of the tropics from the first film for a less glamorous landscape of a Russian mine. The special effects are also less noticeable in this movie as opposed to the first. The Dolby Atmos audio is spectacular and the surround sound is great, as bullets seem to whiz by one's head. The movie also has an eclectic, yet enjoyable, soundtrack that can be heard with all its fullness. There are a number of extras that can be found on the regular Blu-ray in the combo pack, including deleted scenes, Audio Commentary with the Director; God of War: Assembling Earth's Mightiest Antiheroes; Big Guns, Bigger Heroes: The 1980's and the Rise of the Action Film; On the Assault: The Real-Life Weaponry Of The Expendables 2; Guns for hire: The Real Expendables and the Gag Reel. Many of these segments, while long, are informative and entertaining. If you or someone you love enjoyed the first Expendables movie, then you will definitely want to get yourself (or them) this one as well. It's funnier, more well written, and more plot driven while still offering the audience lots of the action they love. It makes a great gift and is definitely worthy of any collection, especially in the 4K format. 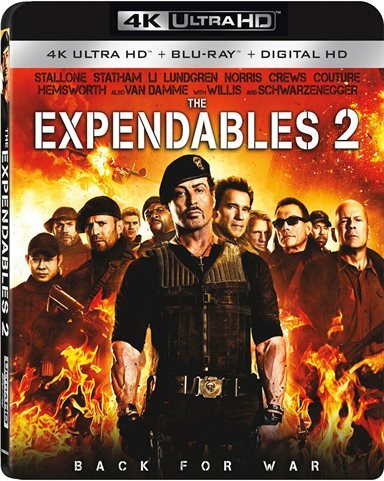 Download The Expendables 2 from the iTunes Store in Digial HD. For more information about The Expendables 2 visit the FlickDirect Movie Database.